High Lift black GRP base with 60mm silver castors. Advanced synchronised mechanism, lockable in various positions and with anti-kick facility. Tension adjustment using a retractable handle allowing operation from the seated position to provide variable tension. Seat depth adjustment providing 40mm of adjustment using easy to operate bar under the front of the seat. 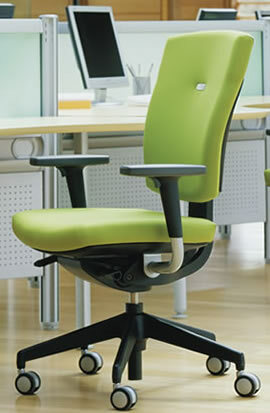 Height adjustable backrest providing 80mm of adjustment. The full and shapely upholstery adds to the visual appeal of the design while providing an instant and excellent level of comfort combined with ergonomic integrity. Through the clarity and simplicity of this chairs' functionality and performance, 'Sprint' exudes common sense with all that's required from an operator chair. Senator has achieved great success with high performance task seating over the years, which has provided a wealth of experience and understanding of market needs. ‘Sprint’ increases Senator's ability to offer a range of task chair styles and levels to cater for all sectors of that ever evolving market.